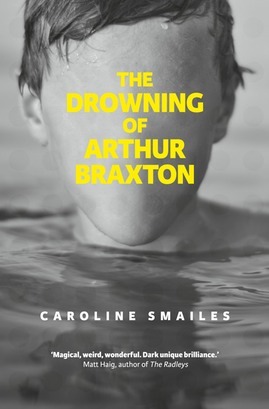 This entry was posted on October 1, 2013 at 5:55 pm and is filed under Books, Fairy Tales, Legend, Superstition with tags Arthur Braxton, Caroline Smailes, Fairytale, Myth, Surreal, Swimming Pool, The Drowning of Arthur Braxton, The Guardian, The Oracle, Water Nymph. You can follow any responses to this entry through the RSS 2.0 feed. You can leave a response, or trackback from your own site. I would really recommend it – beautiful, magical and unputdownable! now it is definitely added to my list of must reads.. Thank you again…it sounds like one of those read to the end then breathe and walk LOLs..
Oh well, the book challenge has well and truly been blown now, so I won’t feel too guilty buying this – sounds good. Do it. You won’t regret it, I promise! This sounds so amazing! The cover is chilling, and if the story itself is as uncanny and captivating as you make it sound, I bet I’ll adore it. I’m not sure what to expect in a supposed combination of Carter’s and Beckett’s styles, only that it’ll be entirely unexpected. I could use a little magical weirdness in my reading life right now. Give it a try – it really is amazing. Strange, sad, shocking and lovely too. An odd combination I know, but it works!